How to send uci messages from c# app to stockfish on android? I downloaded the binary of Android Stockfish arm64-v8a and looked in the CPP source files. In main() there is all initialization, and then there is UCI::loop(), which catches standard input with getline() and writes back with sync_cout(). How can I write to the engine from a c# (xamarin) application? And is it necessary to make some additional initialization? I found this, which could be close to my problem, but maybe it is not. I don't want to spend three days just to see I'm doing complete nonsense. Also I don't know how to recognize Stockfish's console. Is there only one console, no matter how many different libraries the program can use? As I don't understand the technical part much, I'm including a screenshot of what I expect to be the Stockfish I should communicate with :-). If it is wrong from the beginning, please let me know. 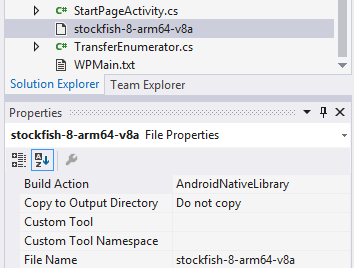 EDIT: What file type is the stockfish-8-arm64-v8a, is it android native library or native shell executable or something else? Where to put the file, how to set it up (in Visual Studio 2015), how to call it from code? I have some code that I tried here but still I can't make it work. This is an incredibly simplified example. In my own code I have a semaphore in order to fully process each output line before moving on to the next one and several semaphores in the UCI start and "isready" handling. For a full overview of the UCI protocol, check out the specification. You're using the compiled Stockfish binary so you don't need to worry anything about C++. You only need to think about C++ if you're compiling the Stockfish source code yourself (but you're not). The link you have is about calling a DLL in C# - this has nothing to what you want to do. The Stockfish program you have is independently compiled, and has nothing to do with Microsoft's DLL implementation. You should start a new engine process, run it and communicate with the engine by UCI protocol. I see you have started +100 bounty, but I think it's a mistake. I believe my answer is accurate but I'm unable to debug your environment. Your problem is the unknown file path. Have you added a text file, and try to read it in your app? If you can't load a text file in your program, you can't start a chess engine. Please give a go. You may want to do it on a simulator. On your PC simulator, you can use path like C:\Engine\SF_engine. Your technical difficulty has nothing to do with chess engine or UCI protocol, and thus off-topic here. I correctly copied the file to folder of my application, but I didn't have permission to run it. and things started to be very easy from now, as Andrew's answer provides fully functional code, which would take also a lot of time to write with not much understanding of the problem, so big thanks to him too. Not the answer you're looking for? Browse other questions tagged engines stockfish programming or ask your own question. How to download Stockfish and install it on the Fritz/ChessBase GUI? Why can't I put Stockfish in SCID? Connecting UCI engine with iOS? Why can't I use my stockfish engine with python chess?